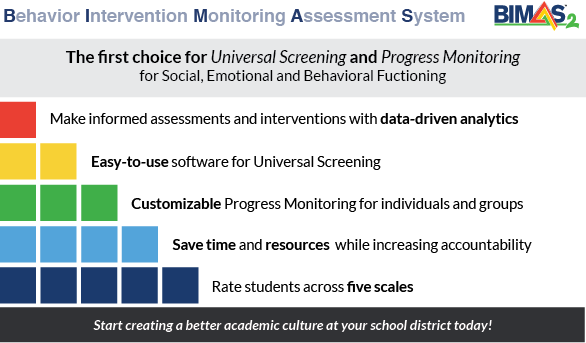 BIMAS-2 is a leading Behavioral Assessment and Progress Monitoring scale being used by some of the largest school districts in the country, such as Boston Public Schools and the State of Hawaii. The BIMAS-2 scale was created by Jim L. McDougal, Psy.D., Achilles N. Bardos, Ph.D., and Scott T. Meier, Ph.D from the State University of New York at Oswego, the University of Northern Colorado, and the University at Buffalo, respectively. The test was standardized in 2005 by MHS. Woodridge Software built the assessment software which consistently achieved an assessment rate completion of 90% for all districts using it. Teachers can perform full class assessments in under 10 minutes and integrations are available for your Student Information System (SIS). BIMAS-2 combines Behavioral Assessment, Progress Monitoring and Social Emotional Learning into a single application. BIMAS-2 gives us the data we need to best support our students. BIMAS-2 allows us to engage in true data-based decision making.